The Vicksburg silver bullion coin marks the ninth of fifty-six issues in the America the Beautiful Five Ounce Silver Bullion Coin series. It is the fourth of five which will be available this year. As a United States Mint bullion product, the Vicksburg bullion coin will not be available for direct sale through the Mint’s website or customer service department. This is a distinction from the companion five ounce uncirculated versions produced specifically for coin collectors. Instead, a network of distributors, known as "United States Mint Authorized Purchasers," buys the bullion coins in large quantities and then resells them in smaller amounts to dealers and precious metals providers for a modest premium above the current spot price of silver. 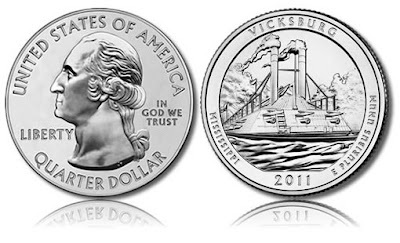 Like the previous 2011-dated issues, the Vicksburg National Military Park 5 Oz Silver Bullion Coin has a total mintage limit of 126,700. This amount is allocated equally among participating AP’s. Authorized Purchasers pay a premium of $9.75 per coin to the Mint, and must commit to buying at least 2000 coins, with 100 increments permitted. AP’s typically have one business week to purchase their entire allotment. Bullion coins that remain unsold are later made available to AP’s who desire more. All the America the Beautiful Silver Coins are struck to a purity of .999 fine silver. They have a diameter of 3 inches and edge letterings of .999 FINE SILVER 5.0 OUNCE. The coins share the same obverse and reverse designs as the companion America the Beautiful Quarters® produced for circulation. The Vicksburg quarter for Mississippi has not yet been released. It is scheduled to launch on August 29. To date, all of the 2010-dated bullion coins have sold out, although they had a lower per coin mintage of 33,000. The first two 2011-dated bullion coins have sold out as well.